I have AcerEntra model: 5100A5. 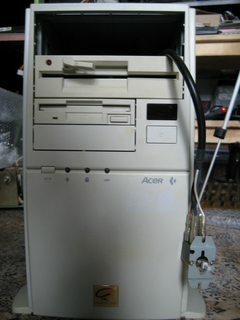 He has socket7 motherboard, but does not have a switch and power supply. 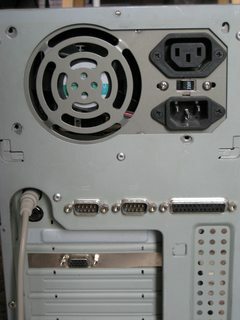 On the Internet I could not find which power supply was installed by the manufacturer and non-standard power switch. If anyone has information on this model, please share. Going to need a bit more information to help you. Is the computer a desktop? 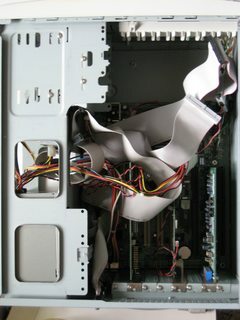 If so, is it an ATX or AT style motherboard? You should be able to use a standard power supply assuming it fits and rig up a generic power switch. Is micro tower and AT style motherboard. I will take a photo soon. The power switch is an unknown design. It's not an unknown design, it's a standard AT style power switch. It looks like you're just missing the proper bracket for the switch. It was a fairly common bracket design back in the day, usually looked like a box with two hooks and a screw tab to hinge into the case and be attached. Can you give a photo of how it looked or part number? 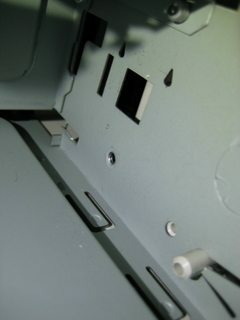 While the power switch is a standard design, the bracket is not. The bracket was almost always designed by the case manufacturer, which is why AT style PSUs never included them. Your best bet would be to take measurements of the hook mounts, screw mount and the distance the end of the power switch needs to be from the face button and design a replacement to be 3D printed. You may have to drill out the hook mounts to be screw mounts since printed plastic hooks won't have nearly the strength of metal ones and will probably snap off. Thanks for the detailed answer with photo. I will try to make a similar construction from metal.